About to kick-start your wedding planning, hunting for that perfect wedding venue in Mira Road, but just don’t know where to start? Let us help you with the most exquisite banquet halls in and around Mira Road, Thane to get you on your way to making that dream wedding come true. Whether it’s a compact small gathering banqueting space or a luxurious wedding hotel with perfectly appointed luxurious rooms, here we guide you to some of the hidden gems to make your big day truly special and that too on a budget. Mauli Grand Banquet, Mira Road, Mumbai, has many halls to offer to its customers depending upon the number of guests and other requirements. Whether you have a tiny kittie to host or a full-fledged wedding reception to plan, Mauli Grand Banquet will have something specific suited for you. The spacious all-white banquet space at Surbhi Party & Marriage Hall, Mumbai, has dark wood pillars and plenty of natural light flooding in from the floor-to-ceiling windows on one side. The venue also has another smaller hall for private functions like birthdays or a mehendi or sangeet ceremony with fewer guests. Surbhi Party & Marriage Hall is also a mere two-minute walk from Mira Road Railway Station and is easily accessible via the Western Express Highway which is a 10-minute drive away. This vegetarian-only venue has the convenience of being located close to Bhayander Railway Station. The elegant hall with decorative columns and ceilings is perfect for weddings, and the management can take care of all aspects of your event, including food (vegetarian only; no alcohol), décor and music, though catering and entertainment by other vendors is also permitted. 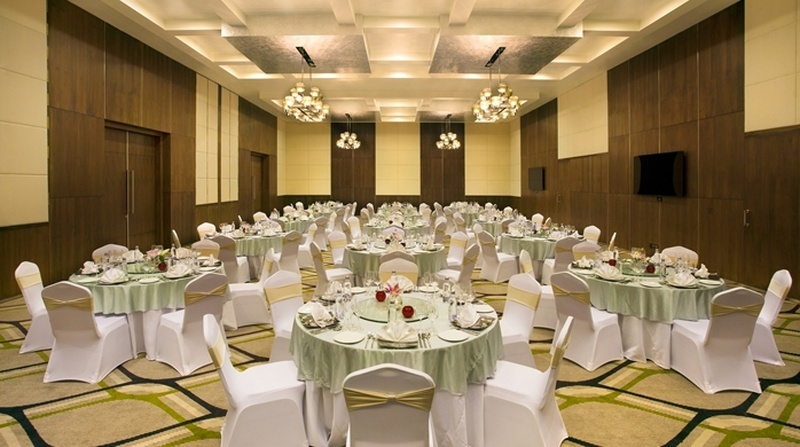 Seasons Banquet, Mumbai's, spacious banquet halls in Thane spruced up with elaborate glass chandeliers and floor-to-ceiling windows that have natural light flooding into the space make Seasons Banquet a favourite with residents in the area. The vast open-air area is an added bonus — perfect for a sit-out dinner reception on a cool evening. With over 90,000 sq. ft. of lush lawns as well as halls, GCC, Mumbai, is bound to have something that suits your specific needs. The 3-star property has special vegetarian, non-vegetarian and Catholic wedding menus with or without alcohol, and can even arrange décor and music. Based outside Mumbai but planning a wedding in the city? The hotel is known to plan ‘Residential Weddings’, popular with NRIs. Take advantage of their packages which include a set number of rooms for the bridal party, along with other wedding arrangements. It’s a perfect place for all kind of functions with small gatherings. The interiors have been tastefully done with gorgeous handmade artefacts. The carved wooden pillars and mirror frames give the ambience a regal feel. The venue has excellent interiors and does not require much additional decor.